Following our move from the text matching service TurnItIn to a rival product Urkund, the most common complaint that we received was the loss of “Feedback Studio” feature of TurnItIn and in particular the ability to easily provide audio feedback to students. Following consultation with our contacts in the Moodle community we concluded that having the ability to provide audio feedback directly to students directly through Moodle would be a very valuable addition to the core Moodle capabilities. In Moodle 3.5 a new feature was added into core Moodle to provide webRTC audio and video recording into the atto editor (See https://tracker.moodle.org/browse/MDL-60848 ). This was initially written by Blindside Networks who work on the Bigbluebutton open source conferencing tool and contributed to the plugin database. We found relevant tickets on the issue on the Moodle tracker system and commented along with others that it was essential to have this also work in providing assignment feedback. We also encouraged members of the community to comment on and vote for this item if they thought it would be worthwhile. This development is yet another example of the benefit of Open Source and the awesome Moodle community. I firmly believe that it would take significantly more time and persuasion to convince a commercial LMS provider to not only take on board users feedback but make significant changes to core product in such a short space of time. The community were able to investigate the code themselves, provide suggestions to Moodle HQ developers and troubleshoot problems as they arose. Of course that it not to mention that this significant enhancement is available at no extra cost to the end users once adopted into core. On so many occasions assessment across a programme can be disconnected. More often that not lecturer “A” doesn’t talk to lecturer “B” to discuss their assessments to identify opportunity for collaboration or at the very least avoid poor scheduling of assignments. Even in circumstances where discussion does take place it normally relies on one individual such as the programme coordinator to instigate conversations with each of the individual lecturers and collate assessment information for the student handbook. In addition to the additional workload created for the coordinator this handbook information can very quickly go out of date if an individual lecturer decides that they need to change their assessment for their module. To help address this we have built a report in Moodle that works on a course page level and is accessible by the teacher associated with the course. This report uses the core ability of Moodle to tag courses in the course page settings. Each programme has a unique code which we use as a Moodle tag for each year e.g. “science1” for BSc in Science first year, “science 2” for BSc in Science for second year etc. Then Moodle pulls all of the assignments from each of the modules assigned that tag. A student studying in first year science studies three modules Chemistry 101, Physics 101 and Biology 101. The plugin that we have developed first adds the tag “science1” to each of the modules. Then any teacher on the aforementioned modules can generate the report through the reports feature on the administration block on their course page. The report pulls all of the assignments in each of the modules and presents them in several formats. 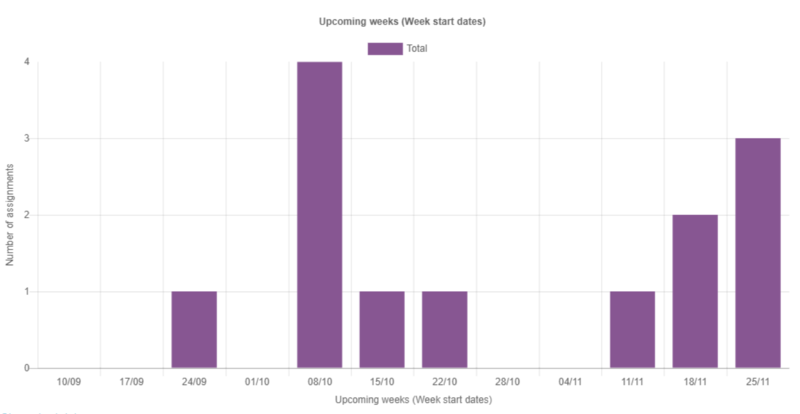 A bar chart with the number of assignments across the next 12 weeks, presented on weekly basis. 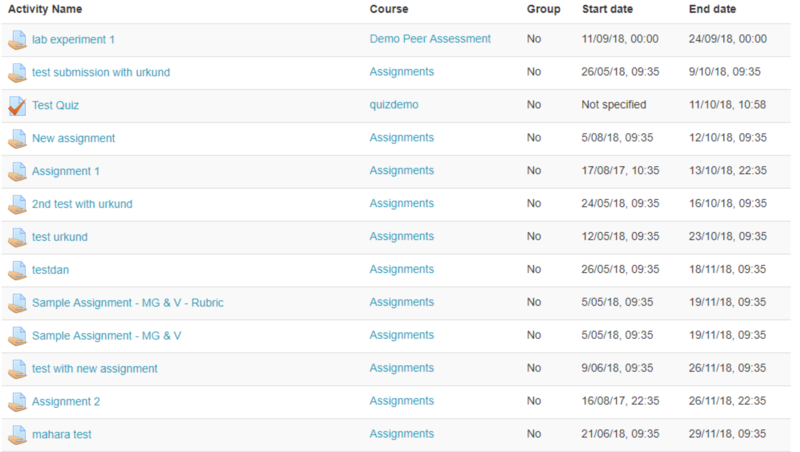 A list of each assignment, their opening date and closing date, the assignment description, whether it is a group assignment or not and what module the assignment is from. The assignment description is available by rolling your mouse over the assignment title. The data is also available to download in a CSV or xls spreadsheet format. Following an evaluation of this report with our staff we intend to make further enhancements to the report and then release it to the Moodle community. I am delighted to announce that a consortium involving DCU led by Ilia State University in Georgia have been successful with our application for Erasmus funding for our project on Academic Integrity. The core objective of the project is to enhance the quality of teaching and learning processes that are based on the principles of academic integrity, supported by policies, mechanisms and tools that help prevent and detect cases of plagiarism in higher education institutions in Georgia. The three year project will involve the design of workshops and resources targeted at both staff and students and involves collaborating with 16 other partners from UK, Austria, Sweden and numerous institutions throughout Georgia. A huge congratulations to the Y1 Feeback team in the final event of their National Forum funded project. I would strongly recommend to anyone teaching in higher education to visit to their project website. Although targeted at first years, the learnings from this project are applicable to everyone.The two year long project culminated with a symposium last Friday, an excellent event with distinguished keynote speakers such as Prof David Carless, Prof David Nicol, Prof Tansey Jessop and Dr Naomi Winstone. I enjoyed each presentation with key takeaways for me from each one, with Naomi’s work on exporting assignment feedback to a students eportfolio being a standout takeaway for me personally. But aside from the aforementioned excellent speakers another element of this symposium was particular satisfying. It was, what I believe will be the real legacy of this project, the diversity of speakers from across the partner institutions. It was not just the case of the usual suspects representing their institution but a mixture of new and experienced lecturers from a variety of disciplines presenting their work. The National Forum projects have definitely raised the scholarship of teaching and learning across the sector but the Y1 Feedback in my opinion has lead the way in this respect in a very sustainable manner. Learning analytics is not a new term for higher education. In fact as far back as 2010 Learning analytics was mentioned in the NMC Horizons report. Last year I had the privilege of attending the LAK conference in Edinburgh in Scotland which is a very established international network of people researching learning analytics. So learning analytics is far from new. But, in my experience, until recently the conversations around student data and learning analytics were limited to a few people within institutions. However in recent months it is a term that is gathering a lot of interest in the every day conversations within higher education institutions. More and more people are seeing the potential and in some cases even realising the benefits of learning analytics. Dr Bart Rientes, Prof Shane Dawson and Prof Dragan Gasevic are people that I follow with great interest. Each of them leading the way in their respective fields, researching different aspects of learning analytics.The National Forum for Teaching & Learning, an organisation supporting T&L in higher education in Ireland has recently launched a project to raise the awareness of Learning Analytics so all of the indicators are that this is an area that is here to stay and will only get bigger in the years to come. Personally speaking I got involved in learning analytics in DCU nearly 3 years ago examining if there was a correlation between a students engagement with the VLE and their success rates in the module. As you can expect, there is a very strong correlation. But we took it one step forward, using historical data we built algorithms to predict a students success based on their current interactions and we gave this information back to students with the hope of it improving completion rates. More information can be found here. Without spoiling the surprise, while the project was a success this project only gave one piece of the jigsaw. Several different initiatives emerged following the findings from this project. 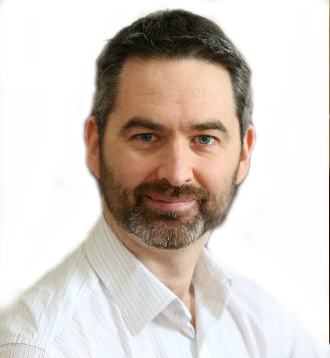 Each one giving a different piece of the jigsaw.The next series of posts will outline the various learning analytics projects that we have conducted in DCU. In conclusion learning analytics has proven to be a powerful tool that can help improve the learning experience of the student in so many ways but each bit of data is only one piece of the jigsaw. My word of caution that I would give to anyone interested in learning analytics is measure what you value, don’t value what you measure! Every staff member and student has a Google Apps for Education account (GAFE). We now have linked Google Calendar with Moodle assignment.If a student has an assignment in Moodle, an “event” is created in their Google calendar. This event contains the assignment title, deadline date, brief description and link directly to the assignment on their Moodle page. This information is dynamic in so far as if a lecturer makes changes to their assignment on Moodle, the students Google Calendar is updated. It always of interest to me how others do it – what do they do better than me and what ideas can I take back and implement in my next conference. But I also find it valuable to identify good bits that I do that they don’t. I find it somewhat reassuring and rewarding to an extent. I don’t mean that in a big headed way – it is just good to know that you are doing something right. They also had pre-conference workshops – I find these incredibly useful especially if you have people travelling a long distance – it is easier to justify travelling a long way for 3 days instead of two. It also gives you an extra day to network. The downside of course is taking that extra day away from the “day job”. There were two workshops both of which proved valuable to me, for different reasons but definitely worth my while. There were a lot of positives about this conference; most of the talks were very good, the food was fabulous (they had a great gluten free selection), the various stream rooms were all very close to one another. The vast majority of the speakers kept to time and in general the conference ran exactly as scheduled. The conference dinner was amazing – we ate in Hatfield palace, the home of Elizabeth I, and the food was most certainly fit for royalty. A negative though would be the lack of a social element to the conference. I feel the organisers missed an opportunity here – the dinner finished at 10 and with most of the participants staying in one of two hotels, it would have been easy to put on the timetable that participants can network in the hotel bar after dinner. Even by reserving a space in the bar and doing nothing else, it may encourage networking. The biggest frustration was the poor quality of wifi. If I was the organisers I would be asking the venue for a refund because the quality and reliability for a purpose built conference centre was very poor. Several of the presenters needed the internet to facilitate audience participation and the poor wifi simply prevented that. Luckily enough those who needed videos from Youtube or content from Prezi had back up plans but for an eLearning conference reliable wifi is an absolute must. In my opinion it seriously reduced the amount of conference traffic on twitter as well. As a conference organiser my heart went out to the conference team as all of the hard work that they had put into place was overshadowed by technical problems beyond their control. Rather than end a blog post on a bad note I want to mention two more positives; They had a big screen in the main coffee area which displayed comments, tweets and conference notifications – a really nice idea and something which I will implement in future conferences they had a notice board with the photos and names of all of the presenters displayed by the registration desk – a simple but effective tool to facilitate networking. Reflections from the conference ECEL 2015, hosted in the University of Hatfield, Hertsforshire. Nearly every time, any conference that I attend, I curse the conference in the lead up to it. For the simple reason taking time away from the “day job” to attend them is so inconvenient. But in the majority of cases and I glad to say including this one, I come back from the conference glad that I have taken the time to attend. Conferences like these are really important professional development opportunities in my opinion. I’m firmly believe that every manager should facilitate their staff to attend them, and I’m glad to say my manager is very supportive in this respect. Looking at this conference through two different lenses – a conference organiser and also a conference participant and a manager. This post will concentrate on the latter, a subequent post tomorrow will look at the conference through the lense of a conference organiser. As a participant, the conference website had all the necessary information and the staff when contacted were fairly quick getting back to you. So inital impressions were very positive and it laid out the path for a promising conference. The venue was a bit awkward to get to and it was split over two venues; pre-conference workshops in the university and the conference itself in a purpose built venue 15 minute walk away in an industrial estate. The university was lovely and very modern – it had a great feel to it and I would have loved if we were there for the three days. The second venue, though nice was very isolated and most certainly did not have the “presence” of a university campus. My talk was on the first day of the conference and I feel that it is always good to speak on the first day because that leaves ample time for networking. The presentation was well received with a lot of positive comments coming both during the presentation and throughout the rest of the conference in various discussions. One or two suggestions for improvements but mostly they were comments of admiration for the work and on more than one occasion Blackboard users saying they would love to change to Moodle. Although this work is essentially platform agnostic because we have access to the core database the raw data is ours to play with and we have no need to involve a big commerical company to do the work on our behalf – hence the VLE envy. The inevitable questions did arise about ethics but once I explained the student centred approach that we have in place there was no issue. As an improvement for next time I will include more of the ethics information up front. Plus it was great to have the website (predictedanalytics.wordpress.com) for the project as a reference guide for the presentation and I look forward to monitoring the traffic for the site over the next few days :). Making a project website was not something I have done in the past but it is definitely something I will do in future for all projects. The most rewarding part of the conference though was to see the experience of my colleagues. From a managers view point it was great to see @clare_gormley excel during her presentation with @dyagetme. Both gave an excellent presentation on the use of wearable cameras. Their presentation was very well articulated and as a team their presentation styles complemented one another very well. Their presentation generated a lot of positive comments. This was very reassuring to me personally because of the management style that I aim to implement. Where possible I try give my team freedom to work on projects of their choosing once they are aligned with the unit’s overall strategic objectives. The professionalism of both their research and their presentation help vindicate my approach. They led this project from the start and not only did they see it through to completion, this work has spawned other similar projects in other schools and programmes. I have no doubt that they will take on board all of the comments given to them today and take this project to the next level. The slides below will give you an insight into their work. In conclusion I believe that our unit and indeed DCU was potrayed in a very positive light over the last few days. Yesterday was evidence (as if I needed any) that both of Clare and Patrick have grown in their roles since arriving in DCU and that we’re lucky to have them on board. One of the most refreshing features within Higher Education for me is our willingness to collaborate and share with our counterparts in other higher education institutions. Following an excellent time at the DCU Summit several participants have created a community of practice and agreed to share scripts that they have developed integrating Google Apps with other IT systems e.g. Moodle and / or student record systems.